In 2009 the New York Times called the fight over Arctic territorial claims, The biggest land grab since colonial times, and said it was accelerating as nations scramble to claim writ over hundreds of thousands of square miles of ocean floor, much of it believed to be rich in natural resources. Determining who controls the Arctic Ocean's seabed won't play out until a few years from now. Russia has decided to postpone its Arctic bid to 2013 while Denmark and Canada have until 2012 and 2013, respectively, to file claims of which Canada's are well supported by maritime law. Norway became the first nation to win control of Arctic territory, when the commission finished its review of Oslo's claims north of Svalbard, a region that lies far south of the North Pole. This leaves Russia, Canada, Denmark and the US to sort out the remainder of the Arctic riches. What has all the maneuvering been about? The U.S.G.S. (US Geological Survey) has also run an assessment of undiscovered oil and natural gas reserves in the region and concluded that the continental shelves are a veritable treasure trove. Specifically, according to U.S.G.S. estimates, hidden within the continental shelves lies between 22 and 256 billion barrels of oil and as much as 2,990 trillion cubic feet of natural gas. These numbers are significant. The mean estimate of undiscovered oil reserves is more than double the amount of oil that has been previously found in the Arctic. Also, the median estimate of undiscovered natural gas in the Arctic represents about 30% of the world’s undiscovered reserves. And there is the Northwest Passage. One day, the fastest way between Asia and Europe will be across the Arctic Ocean from the Bering Strait in the West to Baffin Bay and the Davis Strait in the East. There are a number of possible routes but the quickest and most likely to be ice-free for extended periods of time are those that traverse through Canada’s Arctic islands. The savings in time and cost will be enormous. For example, travel time from Japan to the Netherlands would be cut in half. Moreover, ships travelling through the Northwest Passage will not be limited to the maximum size currently permitted through the Panama Canal, the so called Panamax Ships. 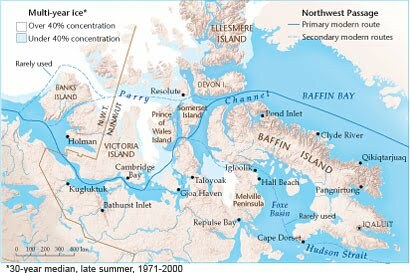 When will the Northwest Passage will be fully navigable? Likely sooner than anyone thinks. 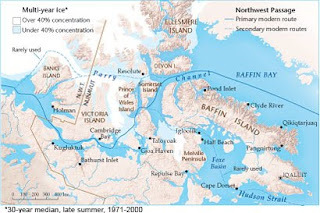 In September 2007, the European Space Agency used a series of satellite photos to establish that an ice-free route through the Northwest Passage existed for the first time in modern history. Now, after years of promises about standing up for Canada's claims to Arctic, the Conservative government has decided it wants swift and permanent solutions to issues that they have heretofore preferred to leave unresolved. Canada will make finding solutions to Arctic boundary disputes this country’s top foreign-policy priority in the far north. The reason being, one can assume, is that Canada is the most vulnerable of all the nations involved in the disputes to a potential loss of control over its Arctic waters -- this due to a lack of appropriate ships, port facilities and infrastructure to enforce the existing laws and regs. Shelagh Grant of the Globe and Mail asserts, Canada no longer has the luxury to dither and debate. If this government fails to take immediate action, Stephen Harper may well go down in history as the prime minister responsible for the nation’s loss of control over its Arctic waters – as will the Canadian people for allowing it to happen.